Home building is coming back even if it is a slow return. The collapse was severe; likely equal to the 1930s if we had the same detailed data then that we do now. Both single-family and multifamily construction dropped rapidly during the period 2006 to 2009 but multifamily rebounded quicker and stronger and by 2014 outperform any recent year. Single-family building fell from 1.7 million per year in 2005 to 430,000 in 2011, a 75% drop. Activity has struggled back up to the 700,000 range or about 60% better than the lowest year. 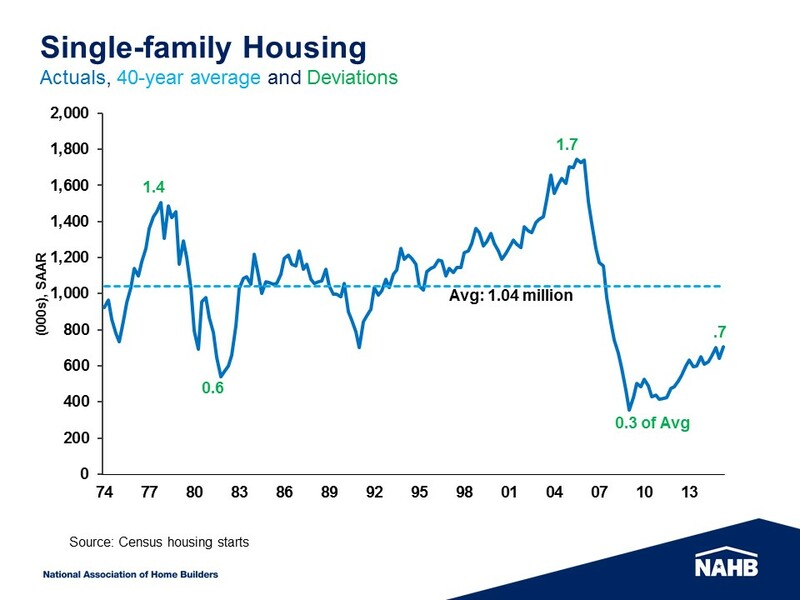 Comparing the extremes to a longer term average, the peak in single-family construction was 70% higher than the 40 year average of just over 1 million units a year. Current levels are now 70% of the long term average. The economy and potential home buyers are recovering and the modest housing revival is expected to continue and even speed up a bit. NAHB forecasts a total of 719,000 single-family starts in 2015 and 914,000 in 2016 or about a 200,000 unit increase in production. Will we have enough builders and suppliers to handle this expansion? The housing industry lost capacity during the crash and some part of that capacity has not returned. 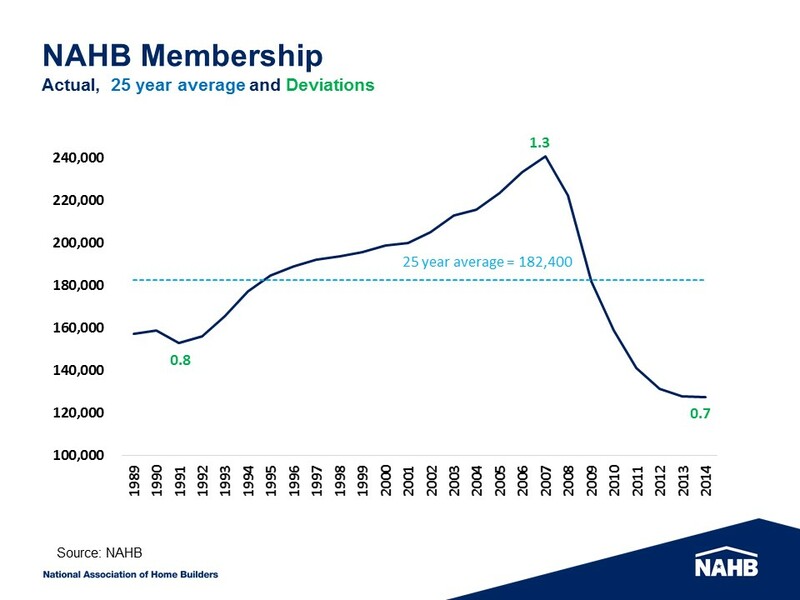 The NAHB membership fell by almost half. Using the same metric as the single-family construction comparison above, the long term average level of builders and associates has been 182,400. At the peak, membership was 30% greater than the average and at the trough was and is 70% of the average. This comparison demonstrates that the growth in membership was not as great as the growth in production, suggesting the average output per member increased. Conversely, the drop in membership was not as severe as the drop in production, suggesting that home builders hung on even when production per company fell. Both membership and single-family production are currently at about the same level relative to long term trends. While a simple measure, the comparison suggests the industry has not grown any new companies because output is at about the right level for the number of companies. Another equally simple comparison makes the same point. Single-family production is about half the level it was in the early 2000s, perhaps the last time the housing market was close to a normal market. Likewise, NAHB membership, as a proxy for industry capacity, is about half way back to where it was before the boom and bust. In addition to whether production levels are sufficient to entice more entrepreneurs into home building, the conditions for establishing a new company are more difficult. Supply costs are rising, debt and equity are more difficult to raise because of investors recent memory and the uncertainty about the future has risen. Basic profit motive will eventually induce more resources, more new companies and more capital as the industry continues on the expected course and more consumers emerge to buy their first or move-up home. Home builders this year have booked their strongest sales since the recession. A shortage of construction workers, however, is making it tough for them to deliver all those new homes on time. U.S. residential construction spending in August climbed above $36 billion, the highest monthly total since October 2007, according to government data. Yet there were 676,500 fewer workers in residential construction nationwide to handle the work this time around.